Reading the October ’18 Release Notes I got interested in the new Playbooks functionality. Since the release is rolling out I started playing around with Playbooks. 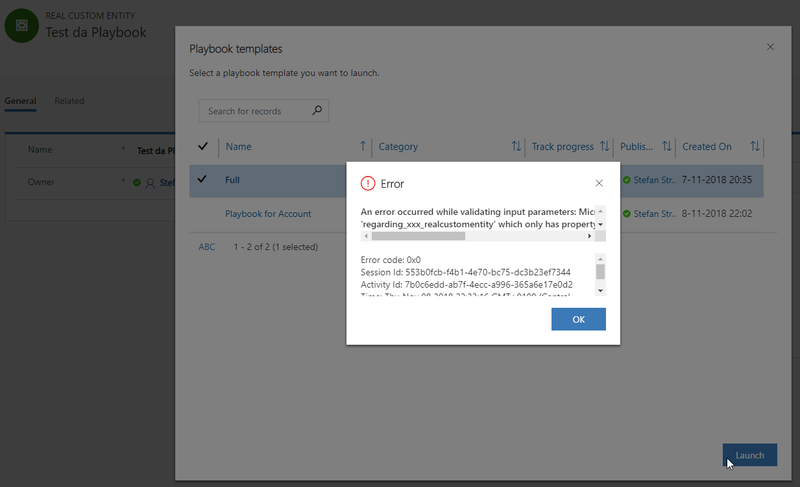 Jukka Niiranen wrote an excellent blog post about Playbooks for Dynamics 365 Activity Templates. Kevin Annfield did his part about Automating Dynamics 365 Playbooks. 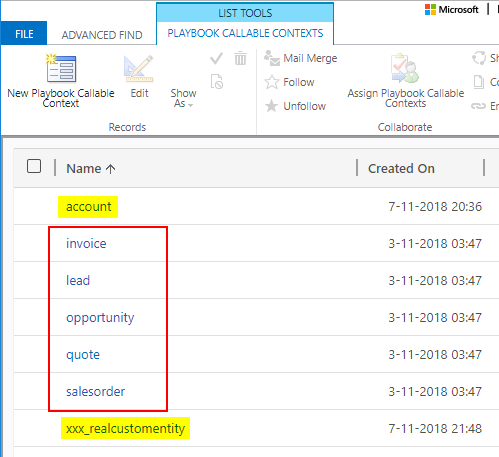 So I wanted to find out if Playbooks can be enabled for entities other than the five Sales entities (Lead, Opportunity, Quote, Order, Invoice), even better for custom entities. 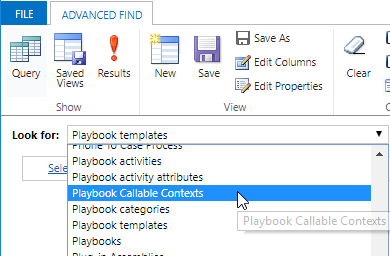 Looking at the Playbook related entities in the Advanced Find, there is an entity called ‘Playbook Callable Contexts’ that holds the entities that are available to choose from in the Playbook template. 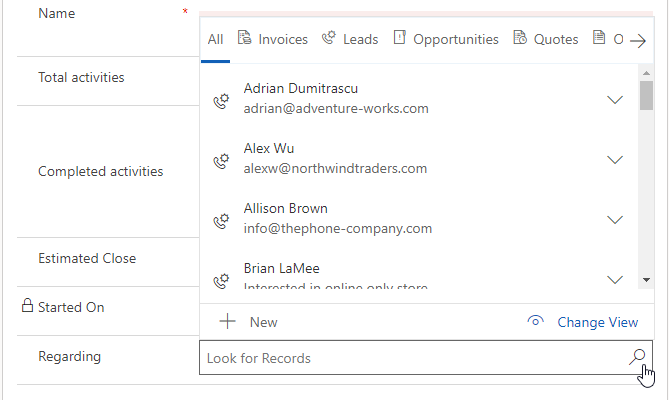 You can add extra entities to this list, including custom entities. So would these also be available in the Playbook templates? Yes, they do. 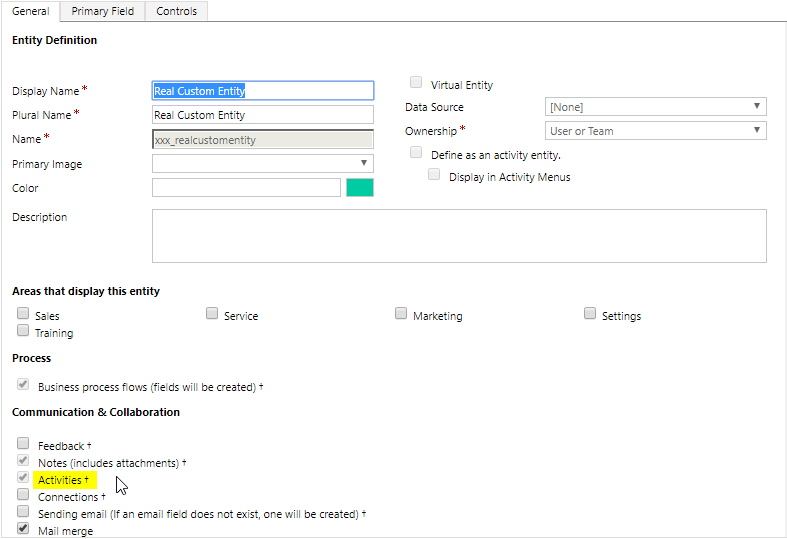 The Account entity and my custom entity are enabled for Activities. When I publish the Playbook template and open an Account form, the button ‘Launch playbook’ is shown. As well at the Real custom entity. An error occurred while validating input parameters: Microsoft.OData.ODataException: An undeclared property ‘regarding_account’ which only has property annotations in the payload but no property value was found in the payload. In OData, only declared navigation properties and declared named streams can be represented as properties without values. Looking at the plumbing of the Playbook service there are a lot of plugins involved to do the action. Probably the code is not generic enough to let it all work. Too bad, it’s just a matter of copying the activities from the Playbook template (in case Progress is not tracked) to the regarding record. Somehow the Playbook service should check whether the targeted entities are enabled for Activities, that’s all. In the Playbook form there is this fancy Regarding lookup with views of the five Sales entities. This is a show-off for nothing, because Playbook records will be created from the context of a “Playbook enabled” entity record by hitting the ‘Launch playbook’ button (so the Regarding field will be populated) or created by workflow as Kevin Annfield has shown. Just give us a plain Regarding lookup without the current restrictions. Do please vote for the realization of this idea, because its gives the business users the possibility to maintain their Playbook templates as Activity Templates for relevant entities, and no more the need to create workflows for that kind of actions. Credits to my colleague Maarten de Meijer who helped my out with the findings.